There is this barefoot trim and there is that. People follow the Ramey Trim, the Strasser Trim, the Jackson Trim. The Wild Horse Trim is observed by some while others name their method the Balanced Trim. Holistic Trimming raises it’s head as well as Trimming for Rock Crunchers. It’s a whole whirlwind of terms and every one is quite sure that this is the way to go. And it is absolutely good to be passionate about something. But it serves no purpose to go crusading about a trim method or about barefoot trimming in general. And not every horse can be barefoot under all circumstances. One of our students asked quite anxiously about her 34 year old school horse. He had shoes on all of his life and she was afraid to take them off, dreading he wouldn’t be able towalk. There is no sense in taking the shoes off a horse that old and make his life hell, because we all know he will feel things he never felt before. 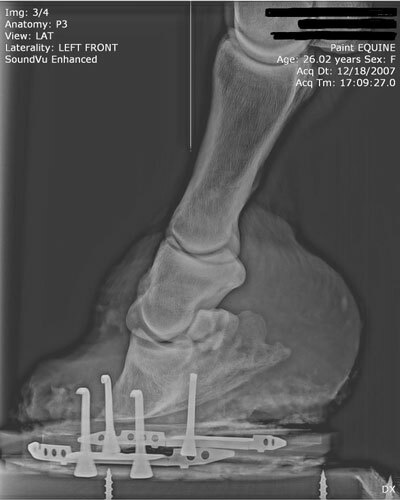 In my practice I was asked to take the shoes off and rehabilitate a mare who had severe metabolic challenges, and after having radiographs taken (see picture), I advised the owner to leave the 26 year old mare in the shoes, but lower the heel somewhat and avoid taking toe off. Just keep the breakover short. I felt that this was kinder to the horse. She did resolve some of her metabolic issues, once she was carefully changed to a more wholesome diet (VitaRoyal), but the next winter she laid down and left her aching body behind. Now I did learn in trim school that everything can be fixed with a good trim and I am hearing from others that “you only have to trim the horse right and give it natural lifestyle and everything will be well”. But experience shows that this simply isn’t true. In today’s world horses suffer tremendously from the onslaught of environmental toxins. As much as we try to feed them the right diet and give our horses the right care, we can only control so much. Granted a natural lifestyle and a correct trim will help a horse to develop a better immune system, but nutrition and detoxification are equally important. Just like in humans. But back to the barefoot discussion. Is it really necessary to be so very rigid about a certain barefoot method? Is it necessary to publish thinly veiled threats about the “other trim method”? Couldn’t we all arrive at some common denominator? I found that there is a little truth in all trim methods and at Equine Soundness we are trying to give our students a lot of different tools to fill up their toolbox for the reality trip into trim land. Yes, we find it extremely important to learn everything we can about anatomy, as it is anatomy that dictates a certain form. And herein lies a problem: We are still learning about anatomy, and while we have a fairly good grasp on the trimming aspect, researchers like Dr. Robert Bowker (United States) and Dr. Chris Pollitt (Australia) do come up with new and intriguing aspects, which sometimes in turn do affect our trim application. So how can you incorporate this into your trim paradigm? Here at Equine Soundness we chose a flexible Internet learning platform, so as new developments occur, we can incorporate them into our teachings. In this format we can keep our students uptodate on all and everything that matters to their continued success in the barefoot trim field. And yes, we are learning something new every day. This is the exciting part of the profession we so passionately practice, there are always new challenges. In fact there are so many that I do not think this can at this time be adequately compiled in a book. By the time you have the book written and published, some of the contents will be obsolete. There is much good to be learned from books, and we are grateful for all the wonderful publications that are out there, but the written and printed word cannot be changed and tweaked as the 21st century Internet allows us to do. So who is right in the barefoot world? Whom should we follow? Well, that is actually up to every individual. Just keep your mind open and try to learn as much as you can. Every method has it’s value. Education is the key to a lot of success. And in my opinion there is no need to condemn the one or the other. There is however much need to research and investigate, which in turn will open all of our eyes to the fact that there is still more to learn and right or wrong is just in the eye of the beholder.